Click HERE for more information on farm conservation planning. Clallam Conservation District provides assistance to farm and livestock owners on a variety of land and livestock management topics. We can help you evaluate the capabilities and limitations of your land and identify the most appropriate Best Management Practices (BMPs) for your particular situation. Don't have animals yet? Great, we can help you develop a plan before you bring animals onto your land. Already have animals? No problem, we can help you identify options for improving your property and livestock facilities. We encourage all farm and livestock owners to work with us to develop a farm conservation plan. Pasture Management - determine productivity and grazing capacity, identify grasses and weeds, efficiently manage irrigation water, develop a rotational grazing system. Manure Management - estimate the volume of manure produced by livestock and options for safely storing and utilizing manure on your land. Mud Management - Identifying causes of excessively muddy livestock areas on your farm and options for minimizing these areas. Stream & Wetland Management - options for protecting streams and wetlands on your land. 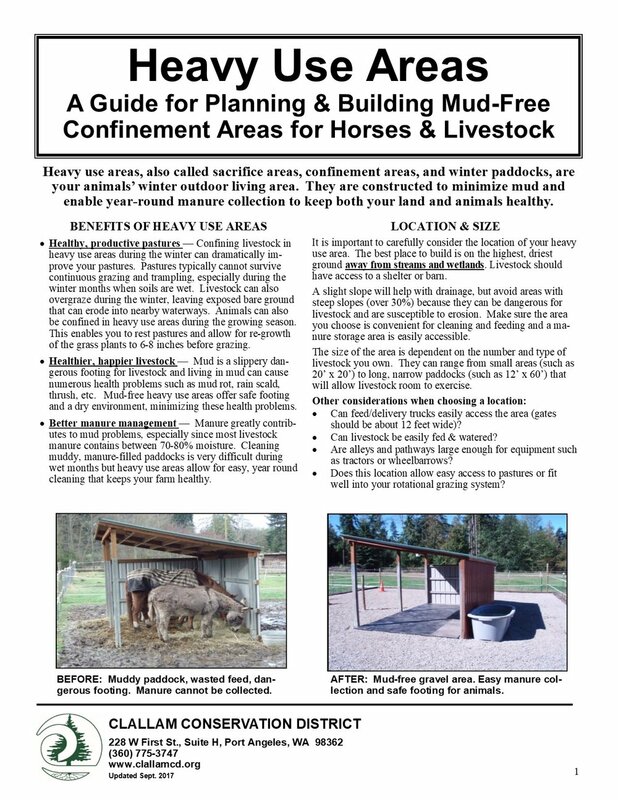 Click HERE for information on building mud-free paddocks for horses. Click HERE for tips on managing livestock manure. Click HERE for tips of managing pastures in Clallam County. The Regional Conservation Partnership Program offers a unique opportunity for local farmers to receive technical and financial help to make farm improvements. Through a partnership between Clallam Conservation District, the Washington State Conservation Commission, and the Natural Resources Conservation Service (NRCS), up to 90% of the costs of conservation practice installation on farms located within the Sequim Bay-Dungeness Watershed Clean Water District may be covered. The Clean Water District includes the Bagley Creek drainage east to and including the Sequim Bay drainage. The cost-share assistance is available through the Environmental Quality Incentives Program (EQIP) offered through the NRCS. Eligible projects will protect water quality, conserve irrigation water, and improve wildlife habitat, while also increasing your production and improving your soil and animal health. Contact the Conservation District at 360-775-3747 ext. 5 for more details. Check out this new guide from the Washington State Noxious Weed Control Board for protecting your horses and livestock from toxic plants!